Whole poached pears make an elegant dinner party dessert, with a nice dark chocolate sauce and fragrant cinnamon and some vanilla ice-cream. To make the poached pears, place all the ingredients except the pears into a small saucepan. Half fill the pan with water and bring to the boil. Simmer for 10 minutes to infuse then drop in pears, cover and gently poach for about 20-30 minutes until soft.Turn off the heat and set aside. To make the chocolate sauce, tip the chocolate drops and cream into a small pan and heat together until you have a sauce, stirring constantly. 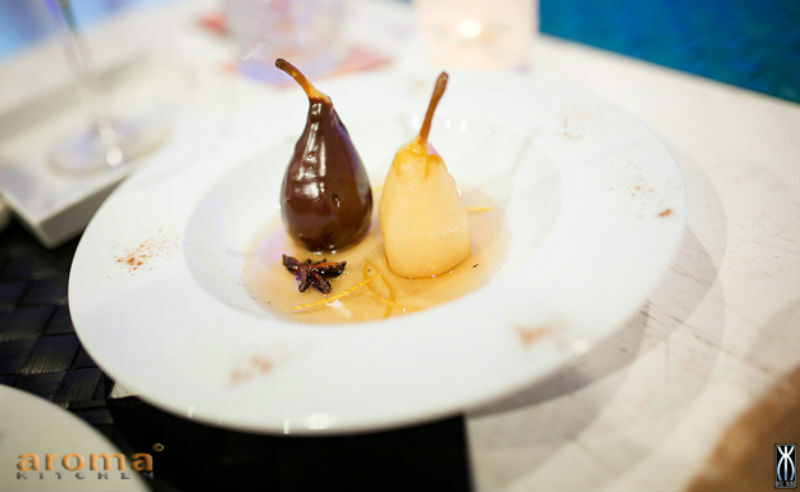 To serve, drain the pears and holding them by the stem, dip them in the chocolate sauce to completely cover. Serve on a plate and you can also serve with vanilla ice-cream.